Samantha Nicole: The Perfect Pedicure? The one part of my body I always tend to neglect is my poor little feet. I don't wear sandals or walk around barefoot, so it's just a part of my body that's never really on show, and in turn forgotten about! I barely make the time to paint my fingernails, let alone my toenails. In a bid to pamper myself, I donned a face mask and took on the task of making my feet look relatively soft and normal. I really should take care of my feet more. I went through a phase of wearing terrible Primark shoes, and as a result, I developed plantar fasciitis. It's a condition where the tendons in your feet (primarily your heel) become inflamed and painful, and it seems like literally nothing will relieve the pain at times. Wear good shoes and treat your feet right! 1. Gather your tools. 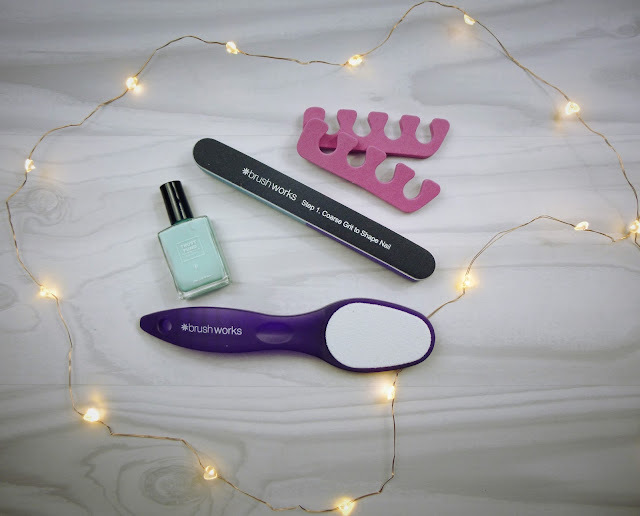 I got my hands on a few pedicure bits from BrushWorks, including a foot file, nail file block and toe separators. I'm desperately clinging to summer, so I'm using 'Hollywood Hipster' by Trust Fund Beauty. I got this at LivHelps and I'm obsessed with this mint green colour. 2. Remove any polish from your toenails. If you're anything like me, this could've been there for years, so tackle it. 3. Soak your feet in some warm water in a large bowl. If you don't have one, use the bath! If you feel like it, add some foot soak crystals, or even just some bubble bath if you like! 4. After ten or fifteen minutes, while your feet are still wet, focus on the hard bits of skin with the foot file. Scrub gently to remove any tough bits and buff your way to soft skin! 5. Using the nail file/buffer, shape your nails to a way that suits you. I liked using the Shape and Shine Buffer because it was really easy to work with, and the sides are all very clearly marked. If you want to, you can always push your cuticles back if they're a little unruly. 6. Put your toe separators in and go to town on your nails with your polish of choice! You should probably wait for them to dry before getting up and wandering about! If you need to clean the polish up a bit, I use an orange wood stick dipped in nail polish remover for an easy and precise removal. And there you have an easy (and probably long lasting) pedicure. I mean, why does nail polish last so much longer on your toes than it does on your fingers? It's a little ridiculous. Do you do anything different? How do you show your feet some TLC?